We have all walked into one of our local “big box” do-it-yourself home centers to find that quick part or tool we needed to get that Honey-Do list job done that has been staring at us for weeks. Inevitably we have all walked down the landscape lighting aisle a time or two and perhaps you have even purchased some of these products in the past. With annual sales of DIY lighting in the hundreds of millions every year, the odds are likely that most folks have from time to time, purchased some of this low cost, do-it-yourself equipment and installed it at their own property even. While the low cost of these products and the apparent ease of installation advertised may sway many into purchasing this equipment off the shelf, after a few years of use, most are left feeling less than thrilled with their purchase. The old saying that goes “The sweet taste of a “good deal” quickly loses its flavor while the bitterness of poor quality lingers on and on.” This saying is completely appropriate when it comes to the bitter disappointment of “box store” lighting. Here are a few reasons why you should stay away from this type of lighting unless you just enjoy burning money. Planned obsolescence: First and foremost, you need to understand that the only way these big retailers stay in business is by selling you products on the cheap, and a lot of them, over and over again.This is also true of the Chinese “lighting manufacturers” that produce low cost, low-quality equipment that floods the shelves of these big-name retailers. Therefore, they are designing their business model on repetitive sales volume and not quality. The more they sell you, the more they make. This model only works if they create a product that has an approximate, pre-determined life span, so that you will eventually discard and re-purchase it many times over again. This is called planned obsolescence and it is a cornerstone of their business model. If this company created high-quality lighting products that only needed to be purchased and installed once in a lifetime and then sold them for pennies on the dollar, they wouldn’t be around long. Low-grade material: The primary materials used in these cheap fixtures is either a flimsy, non-UV resistant plastic or a thin, low-grade “pot metal”. Just because a fixture touts itself as having metal construction simply means nothing. There are no real special formulas or metal mix percentages in pot metal. Pot metal is simply a combination of whatever scrap metal is lying in the next pile to be melted at the Chinese foundry where these fixtures are made, so there is never any consistency in the balance of metal types used. This can leave these fixtures prone to pitting, brittleness, and corrosion quite often. Painted finishes: These fixtures are often covered with a thin painted finish to cover the cheap pot metal below it. When inspecting it in your hand, it seems acceptable but after a few years under the harsh UV of the sun, the paint begins to break down and flake off, leaving the pot metal below visible and open to the corrosive work of the elements. The only type of acceptable finish for long-term use outside is a hard-baked, applied powder coating. Unsafe power sources: The small plastic “power boxes” sold by these stores don’t come close to the level of professional lighting standards, in fact, they can be quite dangerous to the safety of you and your home. The transformers typically sold for these landscape lighting systems are equipped with only a single voltage tap (12v) and also have improper and/or inadequate secondary fusing to suspend any direct short incidents which are bound to happen over the life of this lighting system. This leaves the power center vulnerable to overheating in a direct short scenario and could potentially lead to the power center combusting. Not a great scenario, especially if this transformer is attached to a wall of your home, which it usually is. When installing this transformer on your wall, understand you are rolling the dice and could potentially come up snake eyes. Longevity: Believe it or not, that inexpensive package of lights and the power center you purchased at the home improvement store are built with planned obsolescence in mind. This is a trick that the retail manufacturers play to draw you in with the cheap products, then build them and plan the installation methods in such a way that they fail in a short span of time, causing you to keep coming back to them to replace worn out or defective equipment. At Lighthouse, we think this is a very underhanded tactic and it has given the low voltage lighting industry a bad name. When you hire Lighthouse to design and install a custom lighting system, we never short change our client’s by cutting corners on the quality of the equipment we use and even more importantly, how we safeguard the system for longevity underground. We expect our lighting systems to simply work flawlessly night after night, which is why we back it with the industry’s most comprehensive warranty. Low-quality optics and LED light sources: The biggest question I hear from prospects I meet with is, “I purchased lights at a local retailer, but how come my house never looked professionally done like yours”? The answer is two-fold. First, a Lighthouse lighting designer is trained to know how to properly evaluate a property and a homes architecture. There are a lot of variables to consider when illuminating and it takes a good deal of training, seminars and field experience to get the technique and the “night eyes” to see the proper way of illuminating a home and property. Secondly, the quality of the light source is equally as important as laying the design out correctly. The cheap, low quality LED chipsets that are included in these low-quality retail lights will never produce a professional looking effect similar to what Lighthouse produces. These low-cost manufactures are not interested in the detailed color science of light, but rather in producing the cheapest, “passable” light source they can get by with. Light colors everything you see on your property. If you choose to use an ugly, cheap light source, then don’t expect the deep color rendering of light that can only be produced with a high quality LED that has a high color rendering index or (CRI). Improper wire connection points: Finally, the number one reason these throwaway systems fall apart so quickly and fail, is due to improper wire connections. A proper wire connection will be 100% waterproof and untouchable by the soil minerals in the ground. It will also be tight and secure with no way the wire connection could ever come loose and begin to arc and heat up. Unfortunately for box store system purchasers, they get neither of these 2 critical components. The connection most commonly seen in these types of systems is something called a “pierce-point” connector. It consists of generally a rectangular or round plastic housing that you open up to reveal 2 wire tracks and a few sets of sharply pointed, metal blades. The idea is that you set the wire in the tracks and push the clamp back together, thereby pushing the blades through the protective shielding of the cables and into contact with the copper wire below, making the electrical connection. While this makes for a simple way to connect wires, it does nothing to protect them from the elements. These types of connections are completely open to moisture and ground minerals and have a tendency to loosen over time. As wire connections loosen, there is a greater occurrence of wire melting due to resistance from the connection points arcing (trying to re-establish a solid connection). 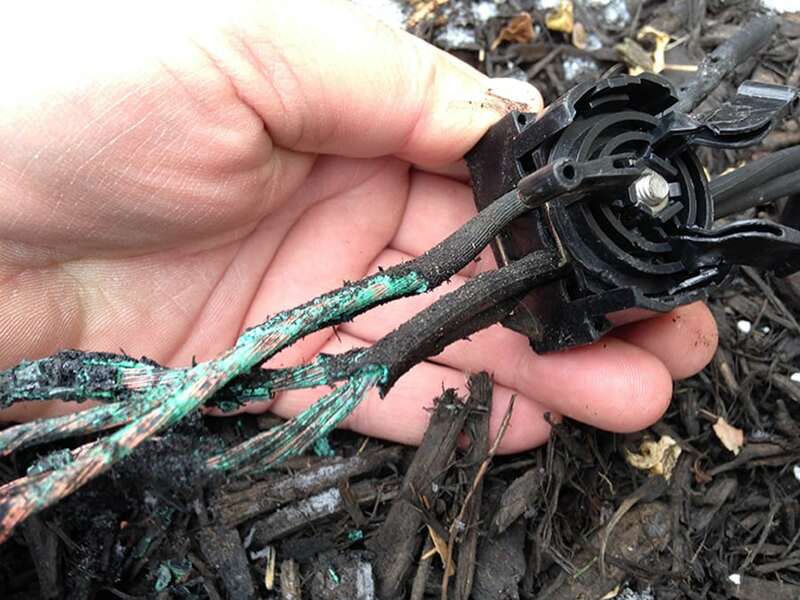 I have seen the cable in garages melt on the wall and even mulch in landscape beds catch on fire due to hot and melting cables from these types of connections. At some point, you going have to ask yourself if this lighting system is really such a great deal after all. A professionally designed and installed low voltage LED lighting system from Lighthouse Outdoor Lighting® uses only the very best quality lighting components available today. A professional lighting system from Lighthouse will cost more than the DIY systems you could go purchase, but in the light of all the shortcomings of those systems, is it really worth it in the end? Lighthouse® only employs solid brass and stainless steel lighting components in its systems that are designed to be purchased one time. With proper maintenance, our systems will last a lifetime. Accept no substitutes when it comes to the safety and beauty of your property; invest in a Lighthouse system and enjoy the peace of mind knowing that you have purchased the highest quality, safest and most thoughtfully designed lighting system on the market today.